Okay, no laughing. 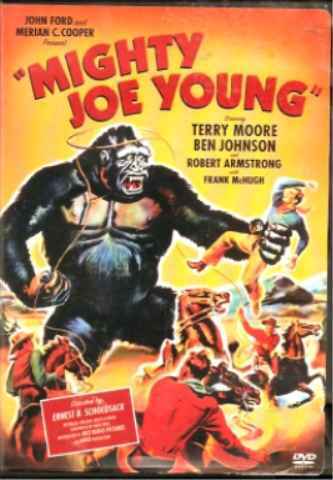 Confession: MIGHTY JOE YOUNG is one of my all time favorite films EVER! I love it to pieces. Not only because it has the happy ending that KING KONG lacked (and boy I can NEVER watch the ending of KING KONG. I'll watch the film halfway through and once they get Kong on the ship, I stop the film. ), but because it has a charm to it that I absolutely love. It may have something to do with Joe's facial expressions which are absolutely perfect as he tries to comprehend what it is that's wanted from him. 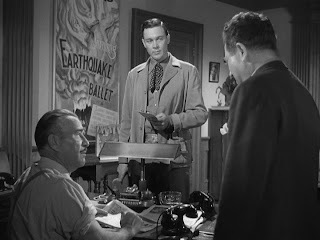 The film also stars the same dude from KING KONG, Robert Armstrong - someone I happen to have developed a crush on once upon a time. (Call me crazy - I know...) This is such a fun film that you don't even mind that Terry Moore - the worst actress ever to come out of Hollywood - plays the ingenue, Jill Young, and Ben Johnson, a guy who later went on to win an Oscar, but who, in this film, doesn't seem to know what to do in front of a camera. None of this matters. It's Mr. Joseph Young's film. 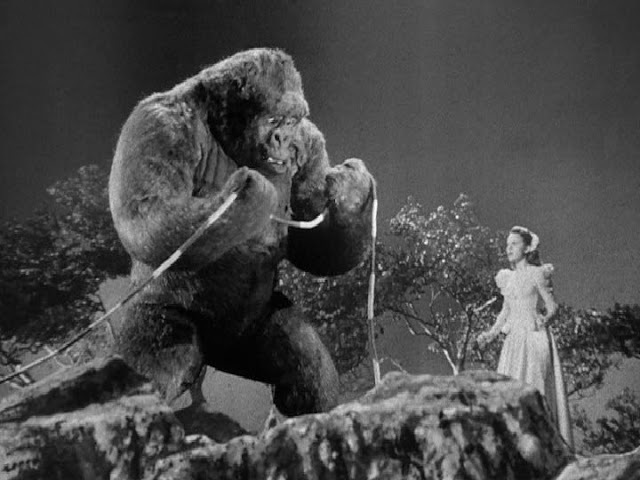 Or at least, the wonderful giant gorilla (in stop-motion photography)created by the genius of Ray Harryhausen and Fitch Fulton and a whole staff of movie-magic makers. The film is directed by Ernest B. Schoedsack and written by Merrian C. Cooper who also helped write and create KING KONG - uncredited. Robert Armstrong plays Max O'Hara, brash Hollywood impresario (he practically invented the role) on the look-out for a hot new act for his new nightclub. He decides on an African jungle theme and so off to Africa with a bunch of cowboys he goes. The cowboys are to lasso lions and bring 'em back alive to showcase at the club. 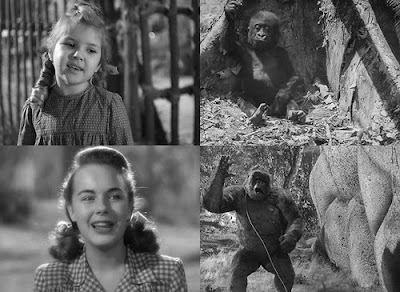 In the meantime, we know, because of the film's charming little prologue, that there's a young girl in Africa with a pet gorilla. We're shown how she traded her father's flashlight for the animal when she was a little girl. We assume the gorilla and the girl are all grown up by the time Max O'Hara and his cowboys head for the dark continent. Sure enough, once the band of Broadway types and the accommodating cowboys - head honcho played by Ben Johnson (a real life cowboy) - show up in the vicinity of the young girl's (now played by Terry Moore) farm, they meet Joe Young in some delightful scenes in which Joe gets the better of the cowboys and their horses and scares the bejesus out of Max O'Hara. When Terry Moore's character, Jill, shows up and makes Joe put down the cowboy he'd been holding over his head, Max instantly sees star potential in the making. Using his considerable wiles, he convinces Jill (despite her misgivings) to bring Joe to America and star in his nightclub act. It doesn't hurt that Jill likes the soft-spoken Gregg (Ben Johnson) and that she's led a lonely life since her dad's death. She's also rather naive and putty in the hands of a smart operator like Max who convinces her that it's all going to be some grand extravagant adventure. Okay, so they arrive back in Hollywood and it's full speed ahead to get the nightclub ready and Joe's act together. Unfortunately, Joe has to be kept in a jail-like enclosure in the basement of the club - something Jill didn't foresee. She begins to have qualms almost before the show begins. The existence of Joe and who or what he might be is being kept a major secret to pump up the publicity for the club's opening night. Once the club opens, Mr. Joseph Young from Africa is a HUGE hit in more ways than one. The club is full every night and Max couldn't be happier. But as time goes by, the audience begins to expect more and more, the acts get riskier and the potential for drunks to make mischief can't be completely kept under control. After all it's a night club - liquor is their chief commodity. One night, while Terry Moore is dishing misery and misgivings with Ben Johnson at a Chinese restaurant - she wants to break the contract and take Joe back to Africa where he belongs - three drunks sneak down into the basement where Joe is sitting in his jail cell sunk in his own misery. One by one they give Joe their bottles of liquor and laugh when Joe appears to get drunk. When one of the men burns Joe's hand when he tries to take the remaining liquor, Joe becomes incensed. And who can blame him? Joe breaks through the iron bars and makes his way up the stairs to the main nightclub floor. Enough is enough. The destruction of the large nightclub's jungle interior (including the very clever orchestra perch and the lions behind their own glass enclosures) are some of the best scenes in the film. This is Joe on a rampage which had been building since he was brought out of his element and forced to perform nightly, uncomprehending, for an increasingly unappreciative audience full of drunks and loudmouths. No wonder Jill is disillusioned. When she and Gregg hear the police cars outside, they run back to the club and manage to get Joe under control. When Joe is ordered shot by the court after he is judged to be a danger to the public, Max O'Hara, admitting it's all his fault - hatches a plan to help Joe escape. Next comes my favorite scenes in the film as Jill and Gregg must get Joe out of the basement while the cops with rifles are at the front door of the now closed club, trying to get in and carry out the court order. Somehow, with Max's help, Jill and Gregg manage to trick everyone, and off they go into the night with a giant gorilla in the back of a truck. The next few hours are spent in a mad chase, eluding the cops, stealing another truck, then detouring off onto a country road where, are you ready? - they come upon an orphanage on fire. Okay, you guessed it. In a harrowing sequence, Joe saves a bunch of orphans from the flames and is himself hurt as a huge tree falls on him. In the end, Joe is spared - after all, he's a hero then - and sent back to Africa to live out his life with Jill and Gregg on the farm. The last shot of Joe waving at the camera ALWAYS makes me cry. Don't ask. As I said before, I love this film. I can't help it that it's corny and sentimental, I love it. Good for us, Pat! KING KONG gets all the accolades, but MIGHTY JOE gets our hearts. I have never seen this one though it's been on my must watch list for a while. Speaking of Apes, have you seen the prequel for Planet of the Apes, Rise of the Planet of the Apes. I'm not sure I'll see it but it seems to explain how the apes became what they are. Ryan: You should see it, for sure. Mighty Joe is SO wonderful. You'll love it. I haven't seen the prequel. Haven't even heard of it. I'll see if there's a trailer.